And so we reach the end of Season 1. The boat sails on, Sayid helps everyone head off to the caves, and Hurley deals with the fact that Arzt just exploded. Rousseau comes back to the camp, where only Charlie and Claire still remain, and Rousseau sends Charlie after Sayid, so that she can steal Aaron away from Claire. When Charlie and Sayid find Claire, they both head off to find Rousseau. The boat has an accident and almost loses the rudder, but Sawyer saves it. Jack & co. take the dynamite and head off through the jungle, the survivors arrive in the caves, and Charlie and Sayid head towards the black smoke, but first they come across the Nigerian plane, and Charlie discovers the Virgin Mary statues with the heroin in them. While walking through the jungle, Kate and Jack see the Smoke Monster for the first time. They start to run away, but Locke instead walks towards the Monster. It grabs Locke and starts to drag him underground, but Kate and Jack save him by throwing a stick of dynamite down the hole. Charlie runs into one of Rousseau's traps and has a pile of rocks dropped on his head. He has a bad gash on his forehead that Sayid has to seal up by igniting gun powder on it. Fun. Jack & co. continue to head back towards the hatch, and Jack & Locke have one of their infamous Man of Science vs. Man of Faith conversations. The people on the raft see something on the radar, as Jack and Locke set up the dynamite around the hatch door. Sayid & Charlie reach the black smoke, and take Aaron back from Rousseau. The Others show up on their boat, and take Walt, shoot Sawyer, and blow up the raft. WAAAAAAAAAAAAAAALT! Sayid and Charlie return with Aaron to the caves. Meanwhile, in the hatch, Desmond wakes up to push the button, and go through his normal "morning" routine, making food, exercising, injecting himself to prevent infection. Meanwhile, Jack and Locke set the dynamite in place, and Locke lights the fuse, much to Hurley's chagrin once he sees that the Numbers are inscribed on the side of the hatch. 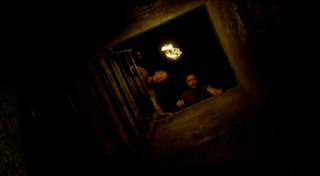 The hatch explodes, Desmond stops what he's doing, gets his gun, and sets up the mirrors to look up at the hatch door as Jack and Locke pull off the hatch door and stare down to the darkness. The episode runs 58:15 and is 488MB to download. You can stream below (via Facebook), or go here to use torrents (better quality, recommended) to download the episodes to your computer. The cut of them blowing the Hatch while Desmond does his thing underground is interesting. The issue is that Desmond's montage happens over quite some time. Even him grabbing his guns and putting on shoes probably takes longer than what it shows. I wonder how it would look as an occasional split screen during the hatch happenings. Arzt is blowing up, Desmond is waking up. They're running from the Monster, Desmond is doing chin-ups. They arrive with dynamite, he's showering. I love the song, but you'd probably want to strip out the audio if you did that. There's no way he did everything he was shown doing in about two minutes. Super late to the party but here it goes: I was expecting to see the scene of Claire scratching Rousseau in the one of the past episodes. It's a flash back right? I think I commented this somewhere on an earlier episode. I could have gone either way on that scene. My thought process at the time was that since that "flashback" was really just Claire experiencing that memory for the first time, that I would leave it for when she remembered it, instead of when it actually happened. If I were to go back and redo it, maybe I go the other way and place it as a flashback, although it does make the present scene when she remembers a little awkward logistically. So yeah, it was a special circumstance, different from your typical flashback, so I didn't end up handling it in quite the same manner.